A Senior ETL developer takes charge of designing the company’s data storage system and troubleshoots issues before they go live. 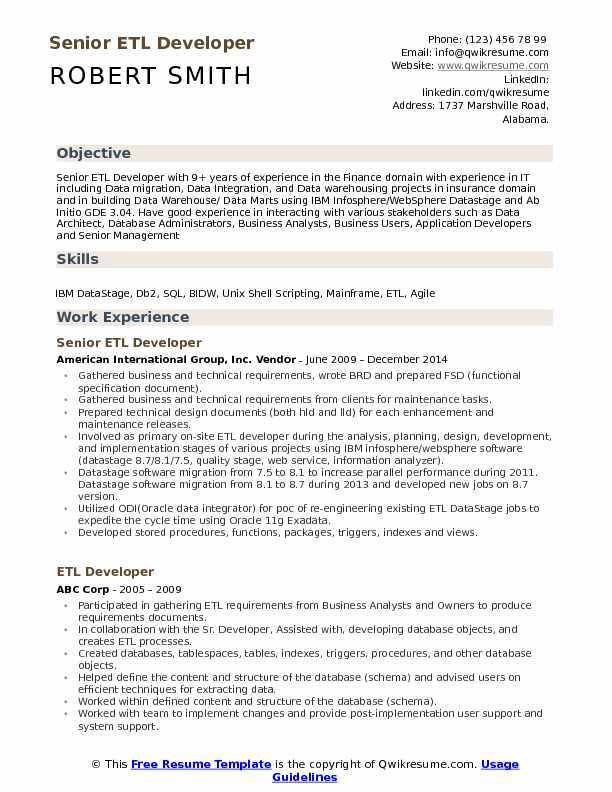 The main job of Senior ETL developer include performing tasks like – creating data warehouse, designing related extraction, loading data functions, testing designs, ensuring smooth running of applications, data modeling, designing best ETL process, designing database on many forms like snowflake schemas or star, creating workflows and mapping it with daily requirements, providing data reports and fixing bugs. 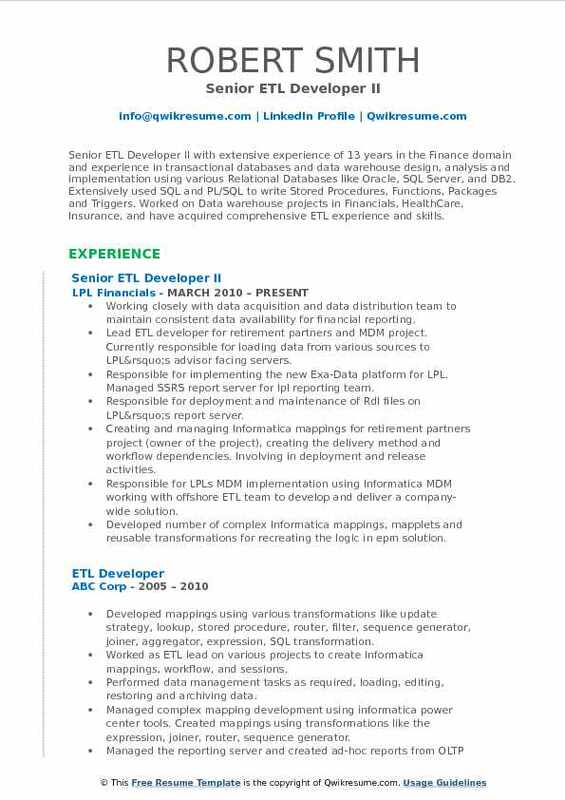 Eligible Senior ETL Developer Resume displays skills and qualifications such as a broad technical knowledge, analytical mind, good communication and job core skills like good coding language grip, familiarity with coding languages and data warehouse architecture techniques. Aspiring candidates interested in taking up this line of job work should reflect a degree in the field of IT or Computer science or the related. Gathered business and technical requirements, wrote BRD and prepared FSD (functional specification document). Gathered business and technical requirements from clients for maintenance tasks. Prepared technical design documents (both hld and lld) for each enhancement and maintenance releases. Involved as primary on-site ETL developer during the analysis, planning, design, development, and implementation stages of various projects using IBM infosphere/websphere software (datastage 8.7/8.1/7.5, quality stage, web service, information analyzer). Datastage software migration from 7.5 to 8.1 to increase parallel performance during 2011. Datastage software migration from 8.1 to 8.7 during 2013 and developed new jobs on 8.7 version. Utilized ODI(Oracle data integrator) for poc of re-engineering existing ETL DataStage jobs to expedite the cycle time using Oracle 11g Exadata. Developed stored procedures, functions, packages, triggers, indexes and views. Troubleshooting database, workflows, mappings, source, and target to find out the bottlenecks and improved the performance. 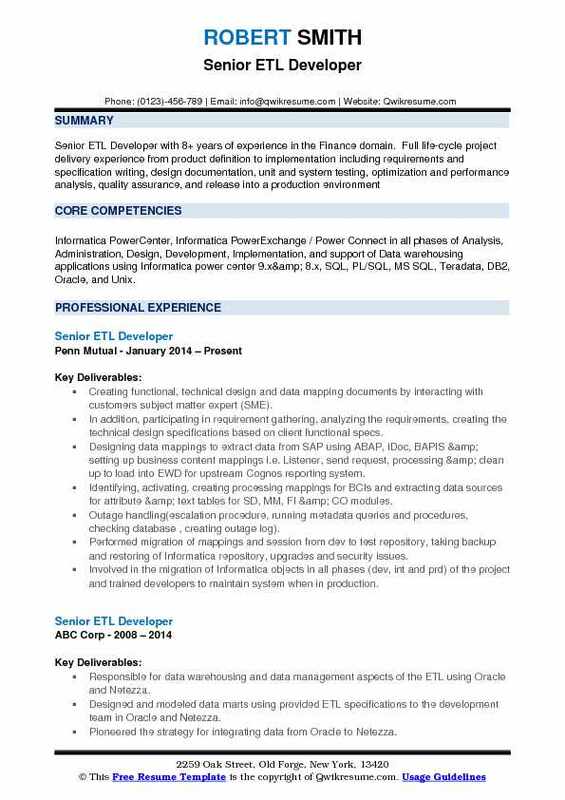 Skills : Informatica PowerCenter, Informatica PowerExchange / Power Connect in all phases of Analysis, Administration, Design, Development, Implementation, and support of Data warehousing applications using Informatica power center 9.x& 8.x, SQL, PL/SQL, MS SQL, Teradata, DB2, Oracle, and Unix. Creating functional, technical design and data mapping documents by interacting with customers subject matter expert (SME). In addition, participating in requirement gathering, analyzing the requirements, creating the technical design specifications based on client functional specs. Designing data mappings to extract data from SAP using ABAP, iDoc, BAPIS & setting up business content mappings i.e. Listener, send request, processing & clean up to load into EWD for upstream Cognos reporting system. Identifying, activating, creating processing mappings for BCIs and extracting data sources for attribute & text tables for SD, MM, FI & CO modules. Outage handling(escalation procedure, running metadata queries and procedures, checking database , creating outage log). Performed migration of mappings and session from dev to test repository, taking backup and restoring of Informatica repository, upgrades and security issues. Involved in the migration of Informatica objects in all phases (dev, int and prd) of the project and trained developers to maintain system when in production. Regular monitoring of the Informatica server environment on AIX UNIX server. 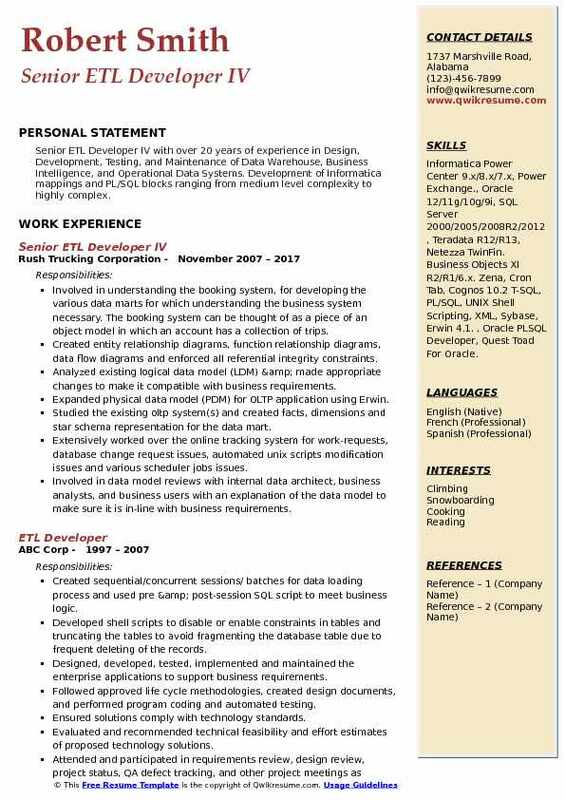 Summary : Senior ETL Developer I with over 11 years of total IT experience and Technical proficiency in the Data Warehousing teamed with Data Analysis, BI, Data Modeling, and ETL Development & ETL Design with full life cycle Implementation of Data Warehouse. Involved in the direct interaction with the clients. Strong knowledge and experience in various sectors like banking, finance, healthcare, pharmacies, and Insurance. Involved in building the logical and physical models. Skills : ETL Tool: Informatica 9.x/8.x, IDQ, MDM (Power Center/Power Mart/Power Exchange/SSIS) Languages: SQL, PL/SQL, SQLPlus. Databases: Oracle SQL Server 7.0, 2000, 2008, DB2, Teradata, Tera Data Utilities,ERP System OLAP Tools: SSRS SQL Tools: SQL Developer, TOAD, SQLPLUS, SQLLoader. Office Tools: MSOffice, MS Project. Operating Systems: Windows, UNIX, Linux, Sun Solaris. Involved in the development of ETL packages or newly built data mart by using SSIS. Addressed the issues related to "834 benefit enrolment & maintenance transactions". Improvement of existing process and implementation of new ETL design. Designed and implemented a data schedule and time-code data from the different entities and processing the data to provide a unified view of the platform (conformed dimension). Supported and implemented appropriate HIPPA standard compliance consolidate redundant operational process using EDI and up gradation from 4010 to 5010 and maintenance of upfront application for research analyses between b2b. Platform (conformed dimension). Developed IDQ standardization mappings according to rules using IDQ transformations and address validators accelerators. Involved in building the logical and physical models for dimensional modeling projects. Loaded the interacting with clients to gather requirements on cleansing rules and data remediation. Summary : Senior ETL Developer II with extensive experience of 13 years in the Finance domain and experience in transactional databases and data warehouse design, analysis and implementation using various Relational Databases like Oracle, SQL Server, and DB2. Extensively used SQL and PL/SQL to write Stored Procedures, Functions, Packages and Triggers. 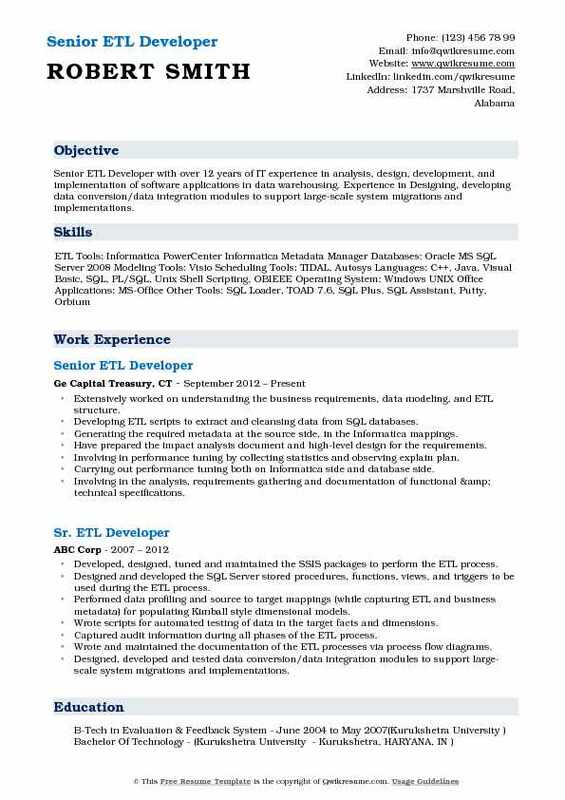 Worked on Data warehouse projects in Financials, HealthCare, Insurance, and have acquired comprehensive ETL experience and skills. Working closely with data acquisition and data distribution team to maintain consistent data availability for financial reporting. Lead ETL developer for retirement partners and MDM project. Currently responsible for loading data from various sources to LPL’s advisor facing servers. Responsible for implementing the new Exa-Data platform for LPL. Managed SSRS report server for lpl reporting team. Responsible for deployment and maintenance of Rdl files on LPL’s report server. Creating and managing Informatica mappings for retirement partners project (owner of the project), creating the delivery method and workflow dependencies. Involving in deployment and release activities. Responsible for LPL's MDM implementation using Informatica MDM working with offshore ETL team to develop and deliver a company-wide solution. Developed number of complex Informatica mappings, mapplets and reusable transformations for recreating the logic in epm solution. Worked with etl factory software to developed templates that could be used to quickly develop mappings to move data from source to target. 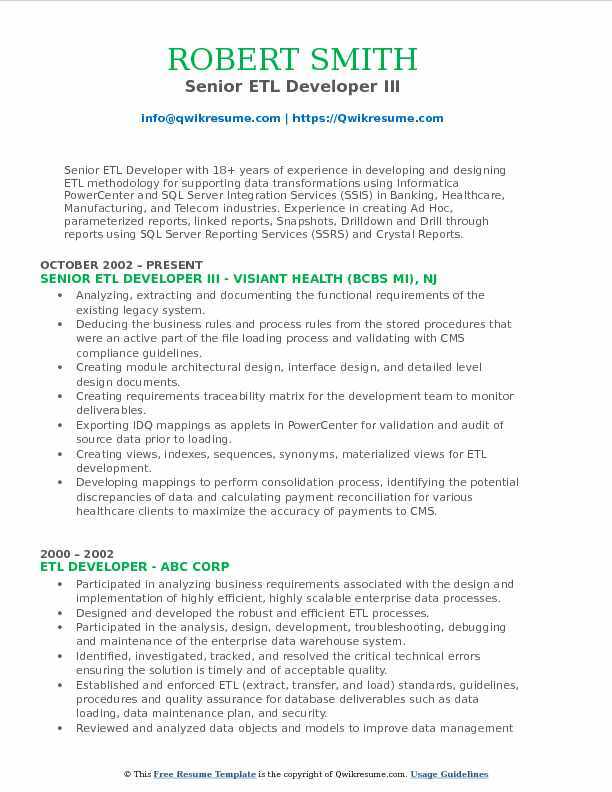 Summary : Senior ETL Developer/Lead with 12 years of experience in the Healthcare domain. Having IT experience in Design, Development, and Implementation and Testing of Database/Data Warehousing applications using Extraction, Transformation, Loading and Data Analysis. Extensive hands-on experience in using the Data warehousing tool IBM Web Sphere Datastage 7.5/ 7.5.1 Infosphere Datastage 11.3, 8.7, Talend ETL and also involved in Data Migration projects. Working on "UHG Talend Migration Project" as an ETL specialist to execute CSP platform which includes Datastage 8.7 ETL to Talend studio ETL with Hadoop. Worked for hands-on Datastage 8.7 ETL migration to Talend studio ETL process. Designing, developing, validating and deploying the Talend ETL processes for the DWH team using Hadoop (pig, hive) on Hadoop. Collaborate with the data warehouse team to design and develop required ETL processes, performance tune ETL programs/scripts. Handled importing of data from various data sources, performed transformation like ETL (extract transform and load) and ELT (extract load and transform) into HDFS. Extracted the data from Oracle 12c, transformed and load in HDFS using Talend studio ETL tool. Analyzing the data extraction by performing hive queries and running Oracle SQL to know user behavior. Continuous monitoring with admin and managing the Hadoop cluster through Cloudera manager. Developing hive queries to process the data and generating the data cubes for visualizing. 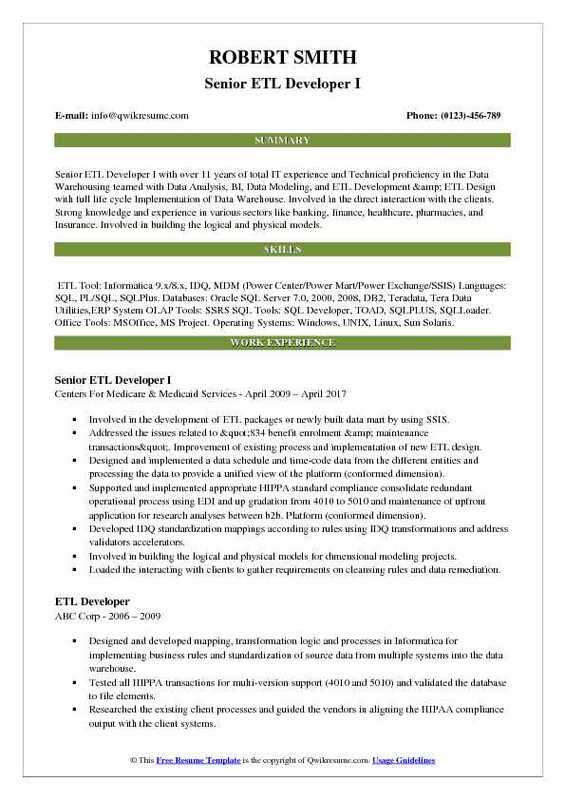 Summary : Senior ETL Developer with over 12 years of IT experience in analysis, design, development, and implementation of software applications in data warehousing. Experience in Designing, developing data conversion/data integration modules to support large-scale system migrations and implementations. Extensively worked on understanding the business requirements, data modeling, and ETL structure. Developing ETL scripts to extract and cleansing data from SQL databases. Generating the required metadata at the source side, in the Informatica mappings. Have prepared the impact analysis document and high-level design for the requirements. Involving in performance tuning by collecting statistics and observing explain plan. Carrying out performance tuning both on Informatica side and database side. Involving in the analysis, requirements gathering and documentation of functional & technical specifications. Worked on data analysis to find the data duplication and existed data pattern. Developing high-level technical design specifications and low-level specifications based on business requirements. 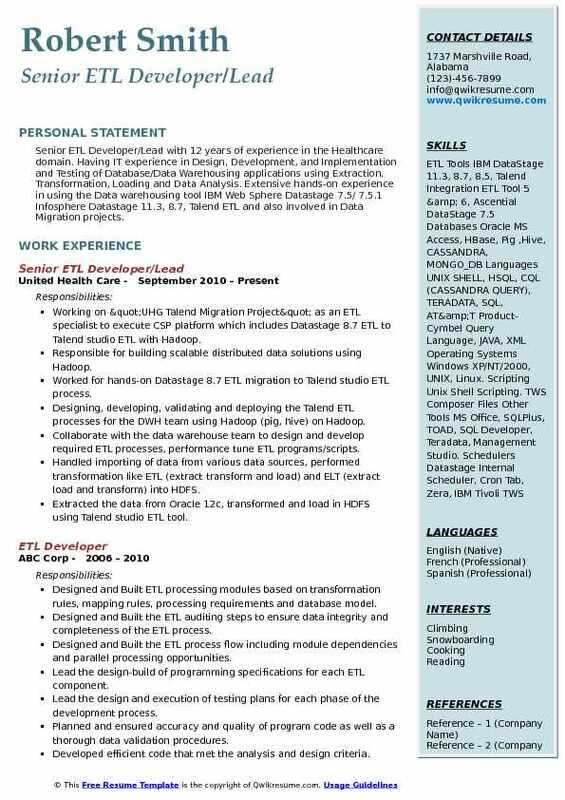 Summary : Senior ETL Developer with 18+ years of experience in developing and designing ETL methodology for supporting data transformations using Informatica PowerCenter and SQL Server Integration Services (SSIS) in Banking, Healthcare, Manufacturing, and Telecom industries. Experience in creating Ad Hoc, parameterized reports, linked reports, Snapshots, Drilldown and Drill through reports using SQL Server Reporting Services (SSRS) and Crystal Reports. Analyzing, extracting and documenting the functional requirements of the existing legacy system. Deducing the business rules and process rules from the stored procedures that were an active part of the file loading process and validating with CMS compliance guidelines. Creating module architectural design, interface design, and detailed level design documents. Creating requirements traceability matrix for the development team to monitor deliverables. Exporting IDQ mappings as applets in PowerCenter for validation and audit of source data prior to loading. Creating views, indexes, sequences, synonyms, materialized views for ETL development. Developing mappings to perform consolidation process, identifying the potential discrepancies of data and calculating payment reconciliation for various healthcare clients to maximize the accuracy of payments to CMS. Designing and developing mappings to incorporate the existing SQL code logic into Informatica using transformations like source qualifier, sorter, aggregator, expression, joiner, dynamic lookup and connected and unconnected lookups, filters, sequence, router and update strategy. Developed mappings to load data into SQL server from Teradata and Oracle databases. 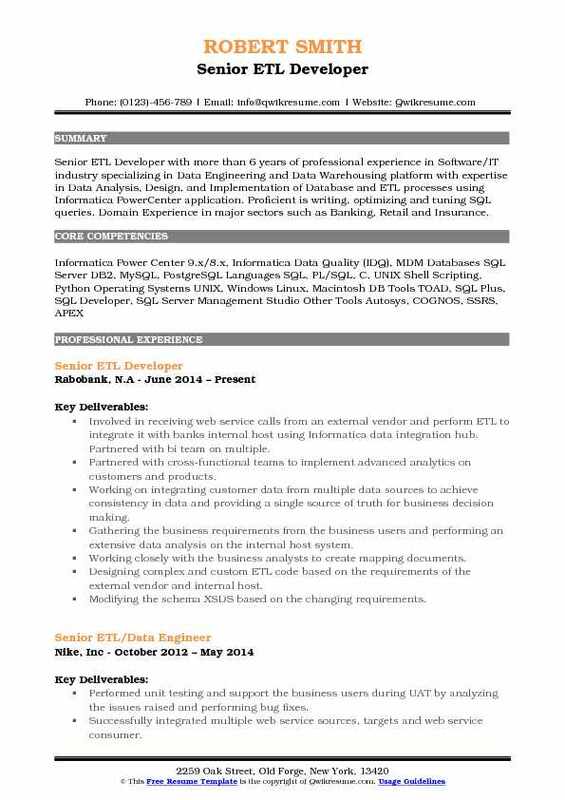 Headline : Senior ETL Developer with more than 6 years of professional experience in Software/IT industry specializing in Data Engineering and Data Warehousing platform with expertise in Data Analysis, Design, and Implementation of Database and ETL processes using Informatica PowerCenter application. Proficient is writing, optimizing and tuning SQL queries. Domain Experience in major sectors such as Banking, Retail and Insurance. Involved in receiving web service calls from an external vendor and perform ETL to integrate it with banks internal host using Informatica data integration hub. Partnered with bi team on multiple. Partnered with cross-functional teams to implement advanced analytics on customers and products. Working on integrating customer data from multiple data sources to achieve consistency in data and providing a single source of truth for business decision making. Gathering the business requirements from the business users and performing an extensive data analysis on the internal host system. Working closely with the business analysts to create mapping documents. Designing complex and custom ETL code based on the requirements of the external vendor and internal host. Modifying the schema XSDS based on the changing requirements. Work with the external vendors technical team closely on the changes in the design of the interface. Working with the bank's network team and external vendor to establish connectivity between the systems. Performed troubleshooting if any issue arises. Summary : Senior ETL Developer IV with over 20 years of experience in Design, Development, Testing, and Maintenance of Data Warehouse, Business Intelligence, and Operational Data Systems. Development of Informatica mappings and PL/SQL blocks ranging from medium level complexity to highly complex. Skills : Informatica Power Center 9.x/8.x/7.x, Power Exchange., Oracle 12/11g/10g/9i, SQL Server 2000/2005/2008R2/2012, Teradata R12/R13, Netezza TwinFin. Business Objects XI R2/R1/6.x. Zena, Cron Tab, Cognos 10.2 T-SQL, PL/SQL, UNIX Shell Scripting, XML, Sybase, Erwin 4.1. , Oracle PLSQL Developer, Quest Toad For Oracle. Involved in understanding the booking system, for developing the various data marts for which understanding the business system necessary. The booking system can be thought of as a piece of an object model in which an account has a collection of trips. Created entity relationship diagrams, function relationship diagrams, data flow diagrams and enforced all referential integrity constraints. Analyzed existing logical data model (LDM) & made appropriate changes to make it compatible with business requirements. Expanded physical data model (PDM) for OLTP application using Erwin. Studied the existing oltp system(s) and created facts, dimensions and star schema representation for the data mart. Extensively worked over the online tracking system for work-requests, database change request issues, automated unix scripts modification issues and various scheduler jobs issues. Involved in data model reviews with internal data architect, business analysts, and business users with an explanation of the data model to make sure it is in-line with business requirements. Developed PL/SQL scripts and conducted data masking on the testing environment to protect sensitive data. Designed and developed complex informatica mappings using expressions, aggregators, filters, lookup and stored procedures to ensure movement of the data between various applications. 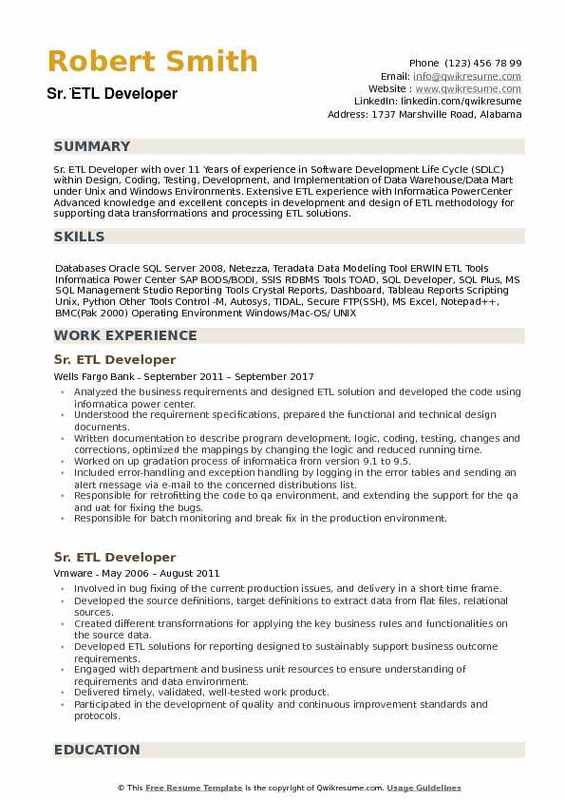 Summary : Sr. ETL Developer with over 11 Years of experience in Software Development Life Cycle (SDLC) within Design, Coding, Testing, Development, and Implementation of Data Warehouse/Data Mart under Unix and Windows Environments. Extensive ETL experience with Informatica PowerCenter Advanced knowledge and excellent concepts in development and design of ETL methodology for supporting data transformations and processing ETL solutions. Analyzed the business requirements and designed ETL solution and developed the code using informatica power center. Understood the requirement specifications, prepared the functional and technical design documents. Written documentation to describe program development, logic, coding, testing, changes and corrections, optimized the mappings by changing the logic and reduced running time. Worked on up gradation process of informatica from version 9.1 to 9.5. Included error-handling and exception handling by logging in the error tables and sending an alert message via e-mail to the concerned distributions list. Responsible for retrofitting the code to qa environment, and extending the support for the qa and uat for fixing the bugs. Responsible for batch monitoring and break fix in the production environment. Responsible for escalation management during the production support along with fixing the bugs.